Seminar Series: The IDPP offers a series of seminars to interested participants around the world as part of its capacity building program. Ms. Dinh Viet Anh is the vice director of the Training and Rehabilitation Center for the Blind at the Vietnam Blind Association. In 1997, after graduating from high school, Ms. Dinh enrolled in the district association of the blind under the Vietnam Blind Association system. She was sent to Hanoi to participate in a teacher training course for the Training and Rehabilitation Center for the Blind under the Vietnam Blind Association. After graduating from this course, she worked as a teacher for 10 years. In 2007, she was appointed to the position of vice president of Ha Tinh Provincial Association of the Blind, where she was responsible for the Education and Training Department as well as the Women’s Department. After two years, she moved back to Hanoi to work as the vice director of the Training Center for the Blind. Ms. Dinh has worked in the Vietnam Blind Association headquarters as an elected member of the Standing Board since March 2013. She took part in a social management course at Hanoi Social Sciences and Humanities University and an English distance course at Hanoi Open University. She has likewise attended training courses and conferences abroad, including information and communication technology courses in Japan and Malaysia, the Future Young Blind Leaders Dialogue in Thailand and an information technology seminar in Sweden. 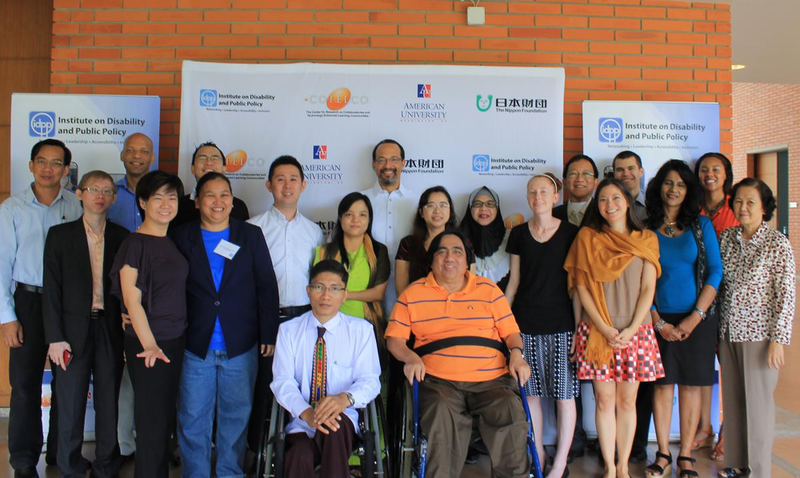 Mr. Tokyo Bak is the senior program manager for disability at AusAID in Phnom Penh, Cambodia. He manages a range of disability programs, including managing relationships with a wide group of stakeholders and supporting other AusAID staff on the inclusion of disability in their programs. Prior to working for AusAID, he spent over twelve years working in various positions, including serving as the Cambodia country representative at Veterans International, an international NGO that provides physical rehabilitation services for people with disability. During that time, Tokyo was also the vice president of the Cambodian Physical Therapy Association. He graduated from the physical therapy school of the University of Health Sciences in Cambodia; the Postgraduate Allied Health Institute in Singapore; and the Graduate School of Management and Economics with a master's in Business Administration from Pannasastra University. Mr. Bak has a strong interest in working with and for people with disability. In 2012, Tokyo received a Gold Medal award from the Royal Government of Cambodia for his contributions in developing the disability sector. Ms. Pwint Oo Mon is a secondary school teacher at the Indonesia International School of Yangon (ISSY) in Myanmar. Prior to working at ISSY, she co-founded Volunteers for the Vulnerable (V4V), which provides relief work to survivors in the delta area after Cyclone Nargis in 2008. V4V supports an orphanage which fosters over 700 children, opens mobile clinics in rural villages and conducts information technology training to underprivileged people. While working with V4V, Ms. Oo Mon worked with persons with disabilities to identify and meet social, educational and economic needs. Through her work, she became interested in disability policy. Ms. Oo Mon also worked with YGA Capital Company Limited as a secretary to supervise mobile retail shops in Yangon, Myanmar. She received a bachelor's degree in Electrical Engineering in 2004 from Yangon Technological University and obtained a master's degree in Public Administration from Yangon University of Economics in 2010. Her areas of interest are cyberlearning and promoting digital literacy for the citizens of Myanmar, including people with disabilities. Mr. Nay Lin Soe is the founder and program director of the Myanmar Independent Living Initiative (MiLi), an organization for persons with disabilities (PWDs) in Myanmar. He is a person with post-polio and uses a wheelchair. Mr. Soe has worked with the disability movement for eleven years. He has advocated for the inclusion and equal rights of PWDs before policy makers and various stakeholders. He also has experience working with the Union Parliament and Ministry of Social Welfare, Relief and Resettlement in Myanmar. Mr. Soe is joint-secretary of the Disability Advisory Committee charged with drafting national disability law. He has visited 11 countries and has participated in several international disability movements. From 2002 to 2011, served as chairperson of the Network for Myanmar Disabled People; secretary of the Disabled People’s Development Organization; community-based rehabilitation (CBR) project manager at the Association for Aid and Relief in Japan; CBR project manager at Eden Center for Disabled Children; and computer instructor and Braille typist at Korea’s Missionary Project. His vision is to create an inclusive, equal society for all. Ms. Yu Ya Thu is originally from Pyin Oo Lwin City, Mandalay Division, Myanmar. She received an M.Sc. in Botany from Yangon University and subsequently worked for a tour company in Myanmar for two years, at which time she began to volunteer and participate in disability advocacy activities within her community. She has volunteered for a disabled persons’ development organization in Myanmar since 2006. For four years, Ms. Thu worked as a project officer for the Association for Aid and Relief of Japan, a vocational training center for persons with disabilities. She currently works for the Myanmar Independent Living Initiative as the operations manager, where her responsibilities include coordinating trainings, workshops and advocacy activities to empower persons with disabilities and advocate for disability issues to government and other sectors in Myanmar society.